Be realistic. The fear of not providing enough to eat often causes hosts to cook too much. Instead, plan out how much food you and your guests will realistically need, and shop accordingly. Plan ahead. Plan your menu and create a shopping list before going to the grocery store to avoid impulse buys or buying unnecessary quantities that may not be used right away and go to waste. Know portion sizes. If turkey is on your menu, allow 1 pound of uncooked turkey per person from an 8 to 12 pound turkey. Larger birds have a larger proportion of meat to bones, so ¾ pound per person should be sufficient (and you will have leftovers). Plan for leftovers. 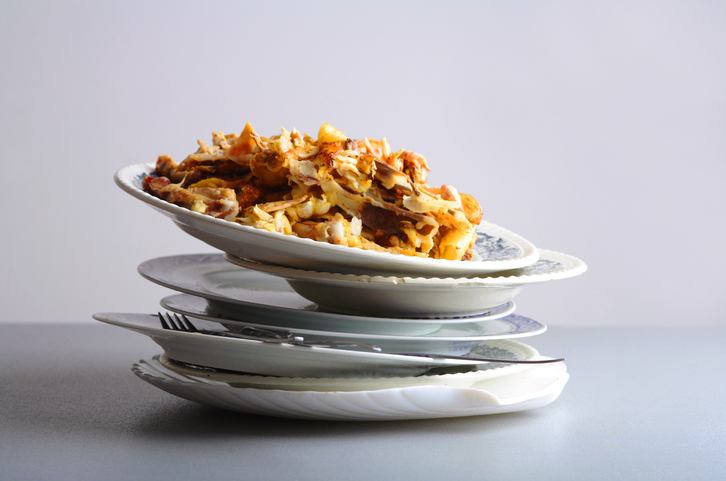 Cook creatively and repurpose food into other meals for less waste after the holiday. Ask guests to bring to-go containers. Ask each guest to arrive with take-home containers and fill them up with leftovers as they leave. Host a post-holiday leftover brunch. Host a fun brunch a few days after the holiday and make it clear you’re doling out leftovers. Not quite enough food to cover everyone? Make it a left-over potluck with one hard rule: no new dishes!